11/4/2019 Operation Compass 2, 1940 WW2 Squares. 4/4/2019 Across the Somme II, France 40, WW2 Squares. 28/2/2019 Part 2 of the Stolberg Corridor 1944 added. 17/2/2019 The Aisne II 1940 added. 7/2/2019 Across the Aisne 1940 France added. This site contains wargame rules and scenarios designed for playing table top wargames with miniatures on a six foot by four foot board covered with 4 inch hexes. The use of 4” hexes was inspired by the excellent hex terrain produced by Kallistra [www.kallistra.co.uk]. I originally purchased some of this terrain to use on my unhexed wargame table. It got me thinking about the possibility of using the hexes for the games instead of measurements and convoluted wheeling and facing rules. The first game I adapted was Panzer Corps, a WW2 division level game. It worked so well and was so much easier to teach to new gamers in this format that I have never gone back to rulers and protractors. I typically fight two to three battles a month. So, time permitting, I should be able to produce a few researched and documented historical scenarios for this site each month. They are provided free of charge in PDF format and placed under the relevant historic page on this site. Rules are included for each of the Eras and the scenarios include any rule variations required for fighting particular historic battles. In some cases the scenarios use commercially available rules. In these cases you will need to purchase the relevant rules. Where the rules were not designed for playing on hexes I will include a PDF of rules variations which enable hex play. 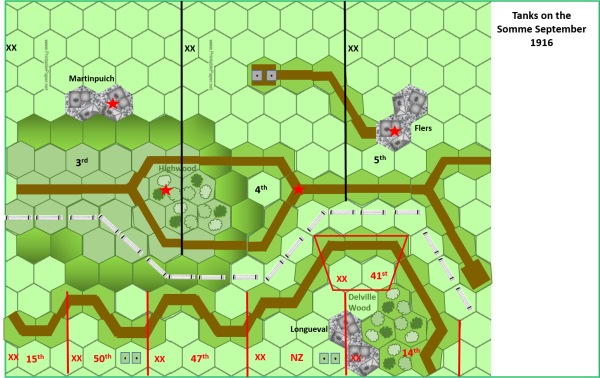 Each scenario has a detailed hex map of the battlefield with the starting positions of the opposing forces. There is a chart of the forces concerned and their strengths under whatever rule system the scenario was designed for. Many of these scenarios are easily adapted for other rule systems working on a similar scale. I use a 2 metre by 1.2 metre table, or around 6 feet by 4 feet, which equates to about 18 or 19 by 12 or 13 hexes. One of the advantages of scenarios using hex boards is that they can give you specific locations for placing terrain and armies. Just like Memoir 44 or other hex based miniatures board games. All of the terrain on the maps is constructed using standard Kallistra Terrain pieces, which will be immediately recognisable to anyone who has this terrain. 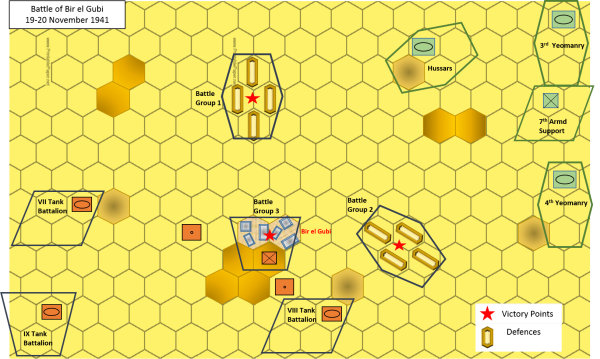 Recently I have come across some war game rules which use squares instead of hexes. These have all of the same advantages as the hex based rules. It is a bit different but worth checking out. Look under the heading WW2 Squares above to see scenarios for one set of these rules. As my interest has always been in playing large scale battles from the point of view of a general most of these battles are at the generalship end of the spectrum where you are commanding divisional, corps or army level forces. Some people like skirmish games. Personally I would rather let Sergeant Schmidt, or Centurion Pullo get on with their jobs whilst I sit behind the lines, preferably in a comfortable chateau, drinking red wine and poring over a situation map. I prefer where possible to refight actual historic battles or games closely based on actual events. I also prefer my games to give me a good return for the amount of time and preparation I put into getting a battle ready. If I have spent days researching Zama, or Ligny or Operation Battleaxe I don’t want the resulting battle to be over in an hour. I want to feel like I have refought one of history’s major battles. So any rules I use are not going to be quick play. Mostly these games do not require large number of figures or stands. In many of these rules one stand represents a lot of men or vehicles and losses are taken in slow steps marked by numbered markers in a hex. If you play so that each casualty is a figure or a vehicle you need a lot more figures. Again, the advantage of hexes is that all markers representing such things as casualties, pinning, disorder etc affecting a stand of figures are in the hex with the stand. So there is no confusion about who they belong to as there can be on an open table top. All of the scenarios included on this site have been played at least once against a live opponent to see how they play out in the real world. Not all of them are even undertakings but all of them have been entertaining and challenging. Notes on the rules used. One of the problems I have with a lot of rules is that they are designed to allow games which can be played inside a couple of hours. This is understandable as many gamers do not have unlimited time to fight a battle. My opponents and I usually put a whole day aside to fight a battle. Some of which it must be admitted is spent drinking red wine and eating. Given the need for fast play rules many commercial rule systems have the capacity for massive casualties to be dished out in one dice roll. This tends to speed up the game by removing units quickly. However, it also adds the capacity for luck to play a larger part in the outcome. Further it means that few rules reflect how long even a walkover attack can take to happen. Particularly when large forces are involved. Generally I have limited the number of casualties that a unit can suffer in any one exchange of fire or close combat. People who prefer faster play can increase the loss capacity fairly easily by just using the number of hits dished out by the dice rolls, rather than using my maximum limit per combat. My rule of thumb for wargame rules is whether refighting an historic battle using those rules produces an outcome that feels realistic given the situation prevailing at the start of the battle. I am constantly surprised at how often this happens, in fact I am surprised at how often the battle turns into a replay of history and you find yourself repeating the "mistakes" of history and realising that rather than mistakes, given the circumstances, there was little else the general could have done. I have rules and scenarios for all of the following eras. Not all of them are on here as yet. I tend to get interested in a particular era so for a couple of months scenarios will turn up from that period. Then I will move on to something else. A number of the rules are based on common game mechanics. All of the rules from Ancients to Pike and Shot use similar mechanisms and it is worth looking at all of these pages and the examples provided on and through them to get a handle on game play. Some scenarios are designed for use with commercially available rules, you will need to buy these rules to play those scenarios. Links are provided to the publishers of these rules and they can all be bought on-line. If you have any questions about the rules, want to provide feedback or have scenarios of your own that you wish to submit feel free to contact me.